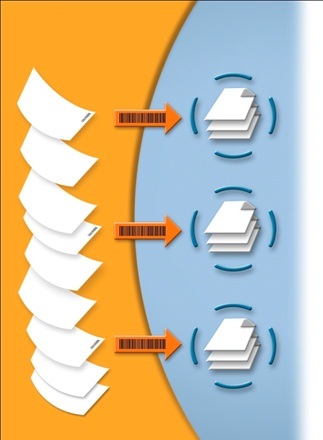 Walk-up Scanning Simplifies Medical Record Capture with Click Free Scanning. This article shows how to scan medical records without any user intervention at the scanner. Click free walk up scanning of medical records is fast, accurate, and can be used by any medical staff. Glidewell Labs, an industry-leading provider of high-quality dental lab products and services to dental professionals nationwide, wanted to automate its medical records capture as much as possible. This included the requirement for a click-free, walk-up solution. Using Fujitsu fi6140Z desktop scanners and ImageRamp Desktop, medical staff at facilities located throughout the US walk up to the devices and simply insert lab order forms into the Fujitsu scanner. The forms are each tagged with a barcode label applied prior to scanning to depict the patient ID. 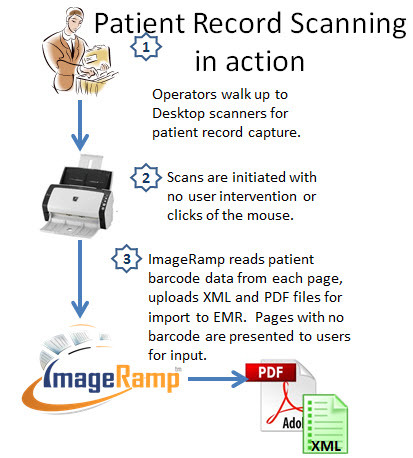 As the forms are inserted, ImageRamp is aware and begins the process of scanning all the pages, searching for the barcodes and extracting the relevant patient data from the barcode. When a page is found containing no barcode value, the software displays the active page to the user allowing for traditional keyboard or onscreen keyboard entry of the patient ID. When a page is found containing a readable barcode, it is automatically indexed and no user interaction is required. As a final step, an XML file is produced with the metadata stored for importing into the LaserFiche system. More on XML Indexing. Key to this process is ImageRamps ability to scan each page looking for barcodes containing patient ID's. As these pages are encountered, the barcode values are read and the data is used along with other input, including user name and date, to name the file and store xml meta data. All this information is saved to a central directory which is then imported into the companies Laserfiche system.